**Edition of 700** "Death Waltz Recording Company are exciting to bring you another record in the 7” Jukebox series with two cuts from the soundtrack to Sarah Adina Smith’s acclaimed drama THE MIDNIGHT SWIM. A found footage drama, the film concerns three sisters who return home after their mother goes missing to find a mystery they need to unravel. Matching the mood are tracks from LA underground artist Mister Squinter (Side One’s ‘Mother’) and Canadian composer Ellen Reid (‘Child’ from Side Two), both mesmerising but with contrasting tones, using sound effects and vocals in innovative ways. ‘Mother’ is nightmarish, full of gothic tones and ethereal vocals like tortured souls. Drums and metal percussion echo in the darkness, creating an oppressive atmosphere that is as unnerving as it is fascinating, and what emerges is something very unnatural. Alien even. It’s a haunting work that stands comfortably alongside Mica Levi’s UNDER THE SKIN in the nascent circle of “anti-music”. ‘Child’ sits opposite ‘Mother’ mesmerisingly juxtaposing itself like a dream against a nightmare. Featuring a sweet music box melody and a wonderfully ethereal Celtic female vocal, it moves from beautiful calm to sudden panic, using the sound of water and a pulsing electronic beat to come to a serenely ambient climax. 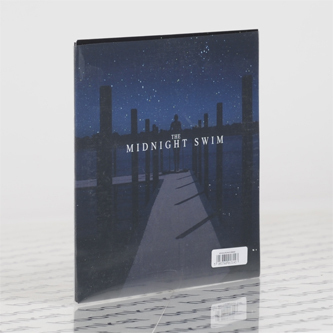 THE MIDNIGHT SWIM is unconventional and uncompromising, but refreshing and beautifully honest."